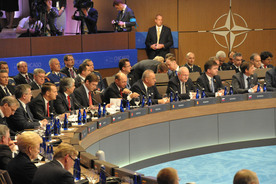 NATO, First steps for the Missile Defence Shield. “It is the first step towards our long-term goal of providing full coverage and protection for all NATO European populations, territory and forces,” NATO Secretary General Anders Fogh Rasmussen told reporters on Sunday. Specifically, this means that the United States has transferred command of a radar system in Turkey to NATO’s command and allowed the alliance to direct the missile defense system stationed on US ships. These ships can also be placed under NATO command. Spain, Turkey, Romania and Poland have agreed to deploy key parts of the U.S. missile defense system on their soil. The White House says it expects initial operational capability by 2015, while the system will be fully functional in 2018. All 28 members of the alliance will participate in the financing.